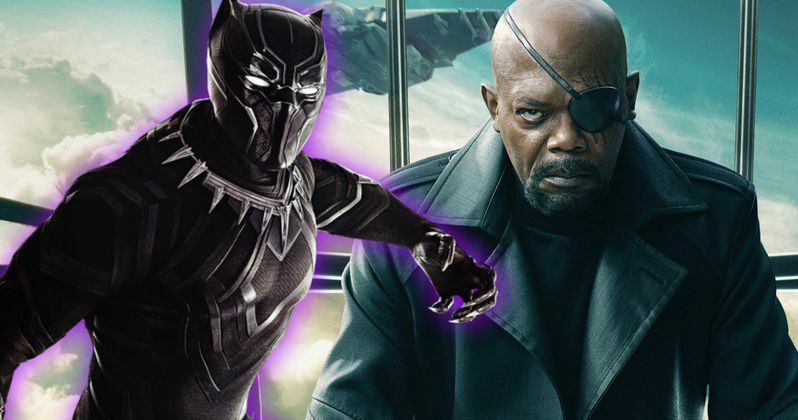 Why Isn't Samuel L. Jackson's Nick Fury in Black Panther? Some Marvel fans were surprised, even shocked, when the official cast list for Black Panther was announced, and Samuel L. Jackson's name was no where to be seen. But perhaps, no one was quite as shocked and surprised as the man himself. Jackson has recently been out and about promoting his co-starring role in Kong: Skull Island, and he made it clear that he was just as stumped by Nick Fury not making the cut for Black Panther as everyone else. Samuel L. Jackson recently sat down with We Got This Covered, when the subject of the Marvel Cinematic Universe came up. It isn't really known where Jackson's Nick Fury might pop up next. Though many have suspected he'll return for the epic 2-Part ensemble Avengers: Infinity War, which is said to be bringing back every surviving character previously seen in the MCU. Jackson confirms that he will be in Infinity War. And he goes onto say that he'll be giving Carol Danvers a helping hand in Captain Marvel. But he won't be taking a trip to Wakanda anytime soon. He explains why he won't be going toe-to-toe with T'Challa. "Yeah, I'd love to do a Nick Fury movie. I'm always open and game. But they got Infinity Wars, two movies to do there, and after that there's Brie [Larson's] movie Captain Marvel, which maybe [Nick] will be part of. Also, I asked them, "So you're doing Black Panther and the only black character in the Marvel Universe is not showing up?" And they're like, "Nick Fury is not in Wakanda!" How can he not know the other black superhero on the planet? How the hell does that work? But they just said, 'No you're not in that one.'" Samuel L. Jackson says he still wants a Nick Fury solo movie. But that might not happen since Agents of S.H.I.E.L.D. is already a TV show that has been on the air for a number of years, making a Nick Fury movie kind of null and void. His role in Captain Marvel hasn't been revealed at this time. But it fares well for his ultimate fate in at least the first Infinity War movie. It is interesting that he'll be making an appearance in Captain Marvel. Brie Larson, who plays Carol Danvers, is already confirmed to make her Marvel debut in Infinity War. It's possible that some of her scenes for that movie will be alongside /captain-marvel-brie-larson-chris-evans-captain-america/Samuel L. Jackson. Infinity War is currently shooting in Atlanta, and it sounds like the actors are showing up in a staggered nature, and that not everyone is sharing the screen with each other all at the same time. Benedict Cumberbatch has a stand-in for the first half of the shoot. And Tom Holland recently showed off his version of the script for Infinity War, which couldn't have been more than 20 pages, so it doesn't appear he'll be getting much screen time. For all we know Samuel L. Jackson might just be getting a quick 'Hello, Goodbye' cameo in Avengers 3 and nothing more.